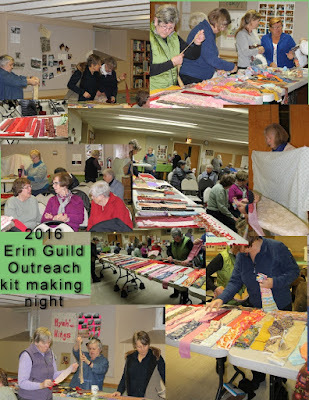 Erin Village Quilters will be having our annual Outreach Meeting. Come out and join us for a fun and social evening. This year our theme is "Pillow Talk". We will be making pillowcases to donate to a women's shelter and to a children's care facility. Get a team together or come and join one. Last year, February 2016, we all stripped! We all cut and kitted strips for the Outreach quilt kits which our members then sewed to create quilts for those who needed comfort. The Erin Village Quilters' January 2017 Demo Night was a great success. Lots of fun and lots of learning.